I’ve always been fond of writing and words, but the fascination has not crossed over to slang. When I was younger, I think, I did manage to speak the way my peers did. New terms have been cropping up now and then and I’m left baffled by what they mean. 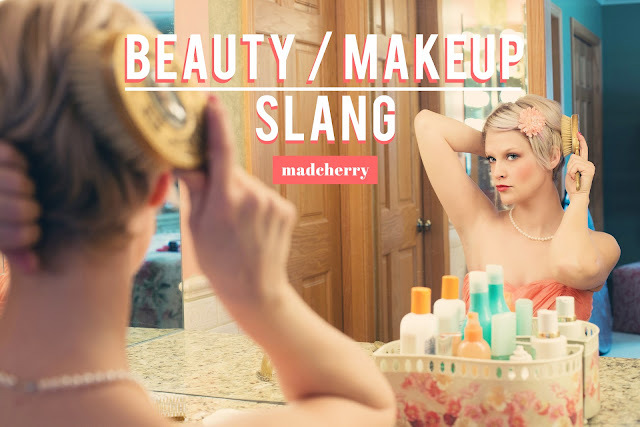 Searching for the meaning of those words led me to reading about other beauty/makeup slang. After a quick browse through Urban Dictionary, I learned the following terms. It apparently refers to the bacon-like mark you get when you accidentally burn yourself while using a hot beauty tool like a straightening or curling iron. The term refers to someone who has become so obsessed with make-up. As the term suggests, you make a “beauty call” when you call for help about something beauty-related, like a late-night haircut (although why would you need something like that?). I also came across a forum called ModelMayhem and learned a couple more words. The term is used when you or someone puts on make-up and it looks cake-y. You apparently say someone has steak lips when they use a brown lip liner and pink lip gloss. We also have a lot of beauty slangs in Tagalog, but I only remember a couple. What beauty/makeup slang do you know and use?